Managing change wisely is critical for Mississauga's continued success and prosperity. As Mississauga is now at the end of its greenfield growth phase, new growth will be accommodated through redevelopment and intensification within developed areas. To address this future growth, the City is initiating Imagining Ward 3. Through a creative community dialogue, residents will help create a vision to direct future growth in the ward. The vision will guide redevelopment and intensification, ensuring residential and commercial development, and natural and heritage conservation are governed strategically. 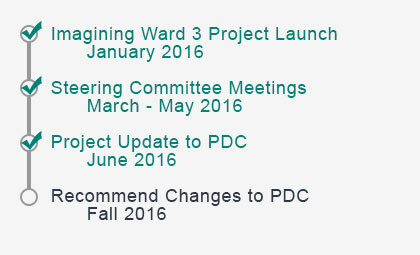 A neighbourhood Steering Committee will collaboratively determine a vision to direct future growth in Ward 3. Findings will be presented in an Imagining Report that will be submitted to PDC. Please consult the following douments fror project-specific information.